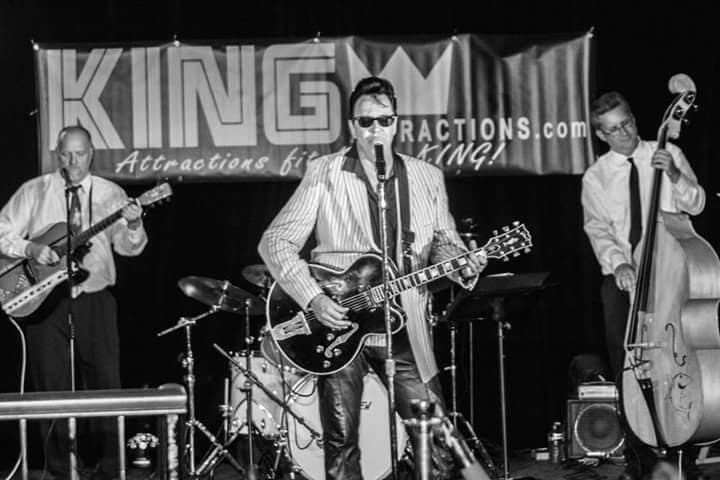 ETA Brent Freeman, wearing his Elvis ‘68 Comeback Special black leather pants, is shown performing with the Tiger Sharks at a King Trilogy event in 2015. Photo provided by Brent Freeman. ETA Brent Freeman hosting the Collingwood Elvis Festival competition, July, 2018. Photo Credit: Lori-Anne Crewe, LA Crewe Photography. 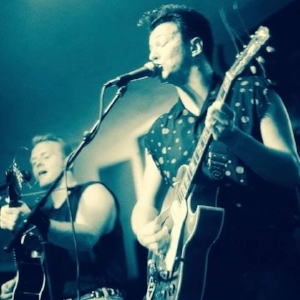 On January 26th, 2019, Brent Freeman and the Tiger Sharks will be appearing, along with Little Joe and the Werewolves, in a rare gig at the Cadillac Lounge in Toronto. Save the date…more information will be posted soon. An oldy…playing my 1953 Gibson es-295. Just like the one Scotty Moore used in Sun Record days. Around 1987…A talent show at Conestoga College where I got my Bachelor degree in broadcasting. I came 2nd singing “Blue Suede Shoes”. I was the only Elvis act. Me in the black shirt with turquoise polka dots. I loved that shirt because it reminded me of Elvis’s RCA signing shirt. After researching the Tiger Sharks band, I had some questions for Brent. Q. Did the Tiger Sharks put out more than one CD? A. We put out two: “Walk With Me” and “This Is Not a Boating Accident”, which was a Richard Dreyfuss line from the movie “Jaws”. “Walk With Me” was recorded primarily at Sun in Memphis. Obviously it was a huge thrill for us. Q. Can you tell us more about the experience of recording at Sun Records in Memphis? A. One of the biggest thrills was just hanging out. When you rent the studio you can do what you please. Our engineer, James Lott, was there when they recorded the soundtrack for "Balls of Fire” with Dennis Quaid. Dennis and Jerry Lee had strippers over while recording…we never did…lol. We had some original Sun guys drop in while we were recording—Malcolm Yelvington and Rufus Thomas. They loved what we were doing and were very nice to us. Recording with the actual “Great Balls of Fire/Whole Lotta Shakin'“ piano was so cool. It is now in the Rock and Roll Hall of Fame in Cleveland, but it was still at Sun when we recorded. It has an identifiable sound that you can hear in our recordings and on Jerry Lee's. Our best memory was when we came back to Sun after our first clump of recording to finish up tracks. James (our engineer) came to me shortly after we arrived and said, "Boy, is Gary (Gary Hardy...the owner of Sun at the time) ever glad you guys came back. He wants to sign you guys." Back then they had a small record company that went under the name "Sun Records" (Sam Phillips still owned the original label name). They had Jerry Lee's one daughter, Phoebe, as part of their roster. We were over the moon! However, in the end, the contract they wanted us to sign wanted rights in perpetuity and we were advised by our music lawyer (same one that Alana Myles was with) not to sign it. We didn't. Q. Did the Tiger Sharks later regret that they didn’t sign with Sun? A. Only from the stand point of being able to say we were with Sun Records…lol. For us, that was soooo unthinkable, but it may not have resulted in any big career. But it would've been great on a resume…lol. Q. Had you been performing as Jerry Lee Lewis before you had the awesome experience of playing on and recording with the exact same piano as Jerry Lee? 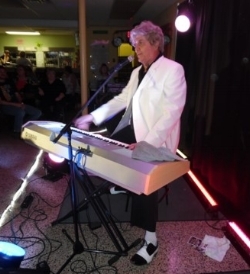 Brent Freeman as Jerry Lee Lewis at the RHLI show, 2018. Photo Credit: C. MacAthur. A. We had done a lot of Jerry Lee at gigs. We'd start a set with some piano based songs (Jerry Lee, Fats Domino', Little Richard) then I would switch back to guitar mid set. The only difference between what I was doing then and NOW is a wig and talking with a Louisiana accent. Lol. Q. 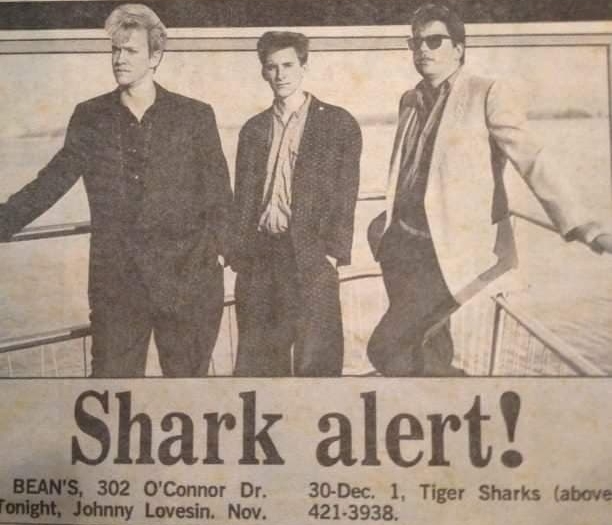 What is the origin of the Tiger Sharks band we see today? 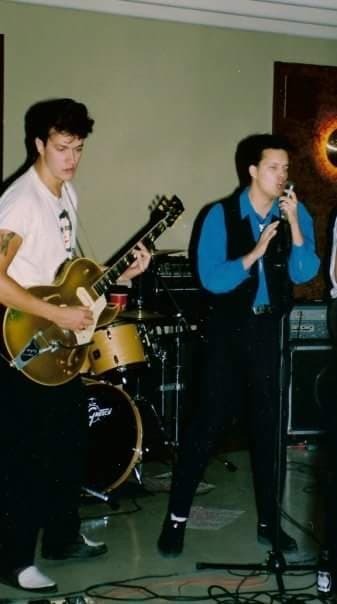 A. Rawhide 99 was Dave Fearnley’s band, named after Elvis’s boat in Clambake). I played with Rawhide just a few times when Dave needed me. But working with him in that band was how Dave got into the Tiger Sharks. We were originally a 3 piece (like the Stray Cats). Derek Winkler (bass) and I started the band and have been friends since high school. And Bill Bruder was on percussion. Newspaper ad announcing our show. I am the one with blonde hair. We made a lot of appearances on Breakfast Television in the 1990s. Brent Freeman and the Tiger Sharks backing Matt Cage, Brent’s business partner and fellow ETA, at the Woodbridge Cruisers Hwy 27 show on June 17th, 2015. Thank you for entertaining us through the decades, Brent. Friends and fans all agree: You are an awesome person and a great entertainer! C.M.